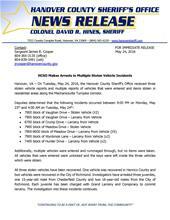 Additionally, multiple vehicles were entered and rummaged through, but no items were taken. All vehicles that were entered were unlocked and the keys were left inside the three vehicles which were stolen. All three stolen vehicles have been recovered. One vehicle was recovered in Henrico County and two vehicles were recovered in the City of Richmond. Investigators have arrested three juveniles, one 15-year-old male from Chesterfield County and two 16-year-old males from the City of Richmond. Each juvenile has been charged with Grand Larceny and Conspiracy to commit larceny. The investigation into these incidents continues. “I am extraordinarily proud of the teamwork displayed between our patrol deputies and investigators, working together to identify victims and quickly apprehend these suspects. I would also like to thank our partners with the Henrico County Division of Police and the City of Richmond Police Department for their assistance during the course of this investigation,” said Colonel David R. Hines, sheriff. The Sheriff’s Office reminds citizens to help us make this type of crime more difficult for the offender and less attractive to commit. Please take the following steps: (1) remove valuables from your vehicle and lock your car doors, (2) never leave your keys in your vehicle while unattended, (3) leave a porch light on during the hours of darkness, and (4) immediately call the Sheriff’s Office if you notice any suspicious behavior or noises.